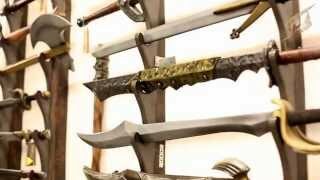 As an Epic Armoury dealer you will gain access to our wide range of LARP products. Our products are not only used in LARP, but are also commonly used in theaters and movies. If you have questions or need support on how to do LARP and how to expand LARP in your territory, we will help you. We have experience in growing our existing market as well as in opening new territories and distributors. Our range of products covers almost all aspects of the LARP hobby and is still being developed and expanded day by day. We design and produce a wide variety of equipment featuring personal character items, archery, make-up, leather crafts, metal works, clothing, weaponry, and a broad range of accessories. Within these categories, we offer a wide range of quality equipment that covers anything from a LARPer’s basic needs to the high-end highly detailed equipment for more demanding players. The Iron Fortress online catalogue contains the complete assortment of Epic Armoury, Stronghold, Ready For Battle (RFB), Epic Effect, and Dark Moon. Our webpage will inform you about availability, attributes, and descriptions of our products. You can download product pictures from our webpage, and we can provide you with a download link for both high and low resolution pictures of our products. We strive to make our products easily available to consumers and retailers through our network of distributors and partners in many regions of the world. All products are packed in standardized boxes in quantities of 1, 3, 6, 12, 24, or 48 pieces, with labeling on all boxes, bags, and products. This gives you an easy overview when ordering, receiving, and handling goods from Iron Fortress. Retailers are also able to order single items if needed. We offer retailers and wholesalers the possibility of receiving large orders shipped in containers directly from our production facilities to your warehouse. We aim to have as wide a range of items as possible. If you, however, have a specific need or an idea that we have not yet seen, we offer you the opportunity to have these items produced at our facilities and adding this to the Iron Fortress assortment. We constantly strive to improve our line of products through experimenting, testing, and receiving ongoing feedback from the LARPing community. Please contact us and we will recommend a distributor in your territory.